Defensive Interval Ratio (DIR), also called the Defensive Interval Period (DIP) or Basic Defense Interval (BDI), is one of the most useful liquidity ratios that calculate the number of days a company can manage its daily operating expenses using its most liquid assets (defensive assets) without touching its non-current assets or external financial resources. Definition: What is the Defensive Interval Ratio? DIR is a useful ratio to measure the liquidity risk of a company. The use of defensive assets ensures that the ratio measures the most conservative (yet realistic) situation of a company’s liquidity. The ability of the company to survive on liquid assets signals towards a strong company, which doesn’t need external support to run its operations. Hence a high DIR is considered good, however, it needs to be looked at more holistically (more on that later). A company can monitor this ratio regularly across the business cycle to understand the liquidity situation during different periods. Many businesses are cyclical across a year or over an economic cycle; for example in the tourism industry customers book their holiday early in the year, but they take the trip only during the holiday season. In the booking season the company receives a lot of cash but it is still contingent on customers actually making the trip. Hence during the booking season, the revenues are very low and they need to manage operations via internal sources. However, this trend changes during the holiday season, when the company starts recognizing revenue for the bookings. It is very important for the company to measure the liquidity situation through the period and compare it with previous years. Let’s see how to calculate the defensive interval ratio. 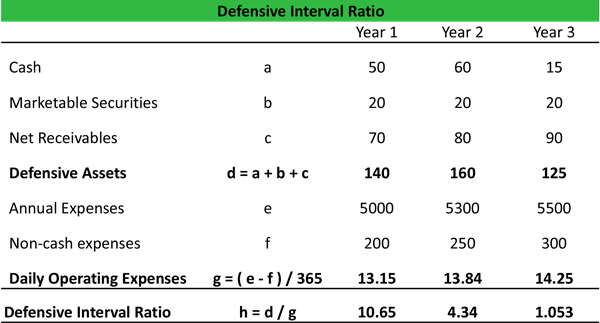 The defensive interval ratio formula is calculated by dividing the defensive assets by the daily operational expenses. Analyst can check the financial statements and notes to accounts for details of all the items in the formula. It is important to identify the underlying defensive assets and daily expenses accurately. Defensive Assets is the sum of cash, marketable securities and trade receivables (other receivables are avoided if they can’t be easily liquidated). Daily Operational expenses refers to the per day operating expense (Cost of Sales, Operating expenses) but excluding non-cash items such as depreciation. Analysts consider DIR to be a more useful liquidity ratio than quick ratio or current ratio due to the fact that it compares assets to expenses rather than comparing assets to liabilities. Let us look at few examples to understand the concept better. Let us look at the example of a hypothetical Company A. The financial data is summarized in the table below along with calculation of the ratios. For example, the ratio of 10.6 implies that Company A will be able to manage its operating expense using the liquid assets for 10.6 days. As we can see the ratio is improving and by the end of year three it increases to 12.6 days. As is obvious from the table above, the companies have very different ratios, which can be a function of the business model. Moreover, the ratio for both the companies has been range bound for three years under consideration (2014-16). Having seen how the ratio is calculated, let us analyze the numbers. There is no perfect answer to the number of days over which existing assets will provide sufficient funds to support company operations. Instead, analysts need to review the ratio over time to see if the defensive interval is reducing; this may indicate that the company’s buffer of liquid assets is gradually declining in proportion to its immediate payment liabilities. Generally, a higher DIR is better as it provides more liquidity for the company. However, sometimes too much liquid assets could be negative as it could imply that the company is not employing capital efficiently to generate higher returns. Analyst need to look at this ratio from the industry in which the company operates. In capital intensive industries, the company might have deployed its capital in large scale projects, which can be long-term value creative. Further, in certain industries it might be a common practice to avail short-term loans to manage operations (like working capital loans) as it might be cheaply available. Analyst need to be aware about all these dynamics before commenting on the DIR of a company. In the example of Company A, we noted that over the three year period, the DIR has improved by around two days. This could be intentional or just some mathematical changes. The materiality of this change needs to be looked at from company’s historical data. In the example of Aaon and Abaxis, the company’s has maintained very strong DIR of over 100 days however; it could be driven by different factors. In case of Aaon, it is driven by a large receivable book while for Abaxis it is driven by large cash position. One needs to read the management discussion and result transcripts to understand the management view on this matter. Lenders also look at this ratio on a regular interval. There may not be a direct covenant attached to this ratio (although it could be possible especially for short-term loans), but it provides a good proxy of the operating condition of a company. Analyst needs to be careful in using the data points for this ratio. There could be several issues with understanding the expenditure and receivables of a company. Many times, expenditure can be lumpy with the company not requiring any cash outlay for several days, but may have to payout large sum at one go. Similar situation is with the receivables. The DIR is commonly used in conjunction with other financial ratio, such as current ratio, to evaluate a company’s financial health. There can be substantially different DIR and current ratio values if, for example, a company has large expenses but relatively less debt. In conclusion, DIR is an important liquidity ratio and provides good understanding of the financial health of the company. However, analysts need to be careful in using the number carefully.